There are a lot of events planned in August and September in Iceland, the two months that mark the end of summer and beginning of fall. The first weekend in August is the Verslunarmannahelgi weekend (roughly translates as Storeowners’ weekend), the equivalent to Labor Day or Bankers weekend. This means that the Monday is a national holiday and many stores are closed during Sunday and Monday (but not all of them). Icelanders tend to travel in flocks to organized festivals around the country this weekend. Many Icelanders consider this the last good camping weekend of the summer. Some of the festivals include lots of music and heavy drinking by the Icelanders. The biggest one is the Þjóðhátíð or National festival in Vestmannaeyjar islands with thousands of participants every year but there are a bunch of smaller ones. So if you are going to be traveling around the country this weekend, expect heavy traffic and an unusual amount of Icelanders on the campsites. And of course there are always those in Reykjavík that do not think that rolling around in a tent for a weekend is fun so there is a fun little music festival for them called Innipúkinn. Video of the lighting of the torches at Vestmannaeyjar. Video by Moldvarpan. The second weekend in August is reserved for Gay pride in Reykjavík where thousands of people come out to celebrate diversity. Gay pride is a family festival in Iceland completely free of politics and hate. 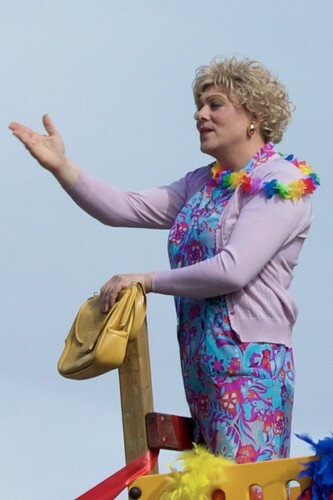 And who knows, maybe the mayor will parade again in full drag like last year. Photo of Jón Gnarr, Mayor of Reykjavík, by Matito. 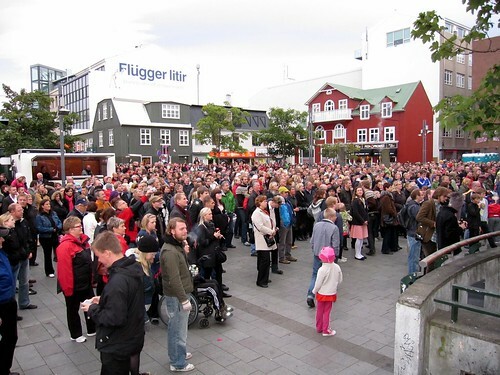 The third weekend in August is another huge weekend in Reykjavík called Culture night or Menningarnótt. All kinds of activities are at your disposal this weekend, check out the plan here (only in Icelandic). The Saturday night is topped off with a concert and an amazing fireworks show not to be missed if you are in town. The Reykjavík marathon is the same day as Culture night and the night also marks the start of the Reykjavík Jazz festival. The Reykjavík marathon, photo by Reykjavik.is. Photo of crowd on culture night by (rinse). September is a bit slower as the city recuperates from all those big events and the country recuperates from tourist high season - and fall is here with all its beautiful colors. August and September is a time for picking berries which is a very popular activity in Iceland. Blueberries and crowberries can be found in abundance in hills in Iceland so if you see people kinda just looking into the ground not moving, you will know what they are doing. And if there is no sign to say otherwise, you are free to pick them as well, enjoy! Photos by Berjavinir and Sigríður Inga Sigurjónsdóttir respectively. RIFF, Reykjavik international film festival, starts at the end of September and lasts roughly 10 days into the first week of October. RIFF is a grand film festival on an international scale. Check out the schedule if you are in the mood for a quality film on a fall night in Reykjavík. Many activity tours stop around September 15th or sooner so book your tour if you still have a chance. A lot of tours start at the same time, such as Northern lights tours. If you have anything to add I would love to hear it, what has been your favorite activity in Iceland in August and September? I'm available at info@sadcars.com.